On an increasingly sunny evening, over goat cheese, a dinner of ravioli with butter sauce, and a Cardamon infused cake, I enjoyed three bottles of wine white. The wines were served by a new friend who inherited his interest in wine from his father. It is for him that I opened the 1979 De Foreville Barbaresco at my house not too long ago. Last week we met up in Seattle for a dinner with mature white wines. The bottles we drank were purchased upon release. All of the wines he selected are drinking at peak maturity right now, though the Sauternes will clearly last. The 2001 Weingut Robert Weil, Riesling Kabinett Halbtrocken, Rheingau is more expressive on the nose but when I revisited it at the end of the evening I was pleased by the evolution of its mouthfeel. The 1986 Domaine Long Depaquit, Chablis Grand Cru Les Clos is a nice surprise because I drink very little old white Burgundy. I thought it interesting how this wine still has some fruit and weight. We wrapped the dinner up with a bottle of 1983 Chateau Rieussec, Sauternes. We remarked on the darker color, perhaps more advanced than other Sauternes, but the wine in the mouth is good. It is a good wine to progress too because it comes across as only moderately sweet which makes it easy to drink. When I returned home I checked a bottle I have, from a completely different source, and it is similar in color. Stay tuned for reports on future bottles drunk together! Note, it was a casual evening so I only jotted down my impressions after the meal. Alcohol 10.5%. A good maturing nose which remains expressive. The flavors are front loaded becoming drier by the middle. The wine is more about mouthfeel which continues to develop over the stones and minerals. Drink up. Imported by Asherton Wine Imports. Alcohol 12.5%. It is a beautiful, golden straw color. The aromas and flavors are in fine shape and any hints of maturity are only reflected in the color and a bit in flavor. It remains focused with a touch of dense weight to the white and yellow fruit over some stone notes. A darker amber color but the wine is in good shape. The nose is gentle, smelling of apricots. In the mouth it comes across as moderately sweet due to the balancing acidity and glycerin infused body. With air orange peel and baking spices come out and the length improves. In a completely balanced state right now. When the end of Prohibition in America was in sight, the “potent” and “celebrated” wines of Chateauneuf du Pape were mentioned as amongst the “Legendary Potions” that the Europeans were waiting to ship to our shores. Once the purchase of wines was legal The New York Times published a thorough description of international wines that Americans should drink. It was, in short, a refresher to the world of wine. From the Rhone were recommended Cote-Rotie, Hermitage, and Chateauneuf du Pape. Chateauneuf du Pape soon became an American favorite. It was always listed for sale typically along with Pouilly Fuisse, at reasonable prices from the 1940s into the 1970s. These were frequently negociant wines but the occasional estate bottled selection like Mont-Redon was available at a premium price. In the 1950s a new style of early-drinking Chateauneuf du Pape was developed largely relying on carbonic maceration. This dip in quality was soon met with a rise in price. The American wine boom of the early 1970s led to the massive price escalation of the 1971 and 1972 Bordeaux vintages. These price increases far exceeded the effects of the revaluation of international currencies from the fixed Bretton Woods system to a free-floating system. This caused most European wines to increase in price some 10% to 20%. In 1973, however, the favored Chateauneuf du Pape doubled in price in a matter of months. The popularity of Chateauneuf du Pape plummeted due to price and by 1981 The New York Times called it “France’s Forgotten Red”. Over the next year wines from such traditional estates as Chateau de Beaucastel and Chateau Mont-Redon were once again available at reasonable prices. These offerings began with the recently released and outstanding 1978 vintage. A few older vintages were available too. Lost amongst the turmoil of price escalation and carbonic maceration is discussion of the vintage of 1964. This vintage is considered excellent but yields were significantly reduced by a summertime hailstorm. Throughout this post-war period, Chateau de Beaucastel is consistently described as a traditional Chateauneuf du Pape estate fashioning wines meant to age. Curiously enough, it is the first vintage in which Jacques Perrin employed his vinification a chaud technique where he heated the grapes. John Livingstone-Learmonth considered the 1964 Beaucastel “a supreme wine”. It was recently served as the oldest wine at a tasting of thirteen vintages of Beaucastel. After starting with a very drinkable NV Billecart-Salmon, Champagne Brut Rose we launched into the Beaucastel. We drank the wines from oldest to youngest. The two bottles of Hommage were decanted and the old bottles were simply popped and poured. We largely rotated who started off pouring the wines so no one person would be stuck with the dregs. Though a few bottles were shamefully off, such as 1978 and 1989, there were many excellent wines. My favorites list includes 1964, 1979, 1981, 1990, and 1995 Hommage. For this post I will just comment on the oldest vintages as they are the least known. The biggest surprise of the night was the 1964 Beaucastel. Due to the high prices of Chateauneuf du Pape in the 1970s, less was imported and sold in America. This in part contributes to the difficulty of finding older vintages here. This particular bottle came from a parcel that Mannie Berk, The Rare Wine Company, purchased several years ago from a European cellar. The bottle, label and capsule were in pristine condition and so was the cork when I extracted it. A quick sniff revealed good fruit on the nose and a remarkable amount of fruitiness in the mouth. Incredibly, the wine opened up with air and continued to drink well for nearly four hours. David Bloch was reminded of a bottle of 1964 J. Mommessin, Clos de Tart that he, Lou, and I drank this summer. They both taste of a similar period and style. If you review older articles about Chateauneuf du Pape it was at times equated as a less expensive Burgundy. In fact there are a handful of advertisements in England and America where Chateauneuf du Pape is listed under the heading Burgundy! Everyone at the table commented on this wine. Though no consensus was formed, there was discussion of the 1981, 1990, and 1995 Hommage as being favorites of the night. I will add one observation. The bottle of 1964 was the first one finished off including the very last dregs. This was my second time tasting the 1976 vintage this summer. Both from bottles Darryl sourced. This evening the 1976 was less advanced but it is still a solid wine at best. The 1979 vintage proved very interesting. It is an acidity driven vintage, bright and not ripe like the 1964. I kept returning to my glass to be consistently surprised at how youthful it stayed. Bill is spot on with his comment that it is on the same glacial pace of development as the 1964. In contrast the 1981 vintage is a beautiful, elegant, and gently ripe wine that is drinking very well right now. Please find my tasting notes below. Imported by T. Edward Wines. Alcohol 12%. There is a good, fruity start followed by the presence of a yeast bit but the fine, ripe fruit soon takes over. This is a generous wine with balanced bubbles, and even some grip in the finish. I would not be surprised if some wine saw oak for there is a sense of old wood. Drinking great right now. ***(*) Now. Imported by The Rare Wine Co. Though light in color there are plenty of aromas and flavors. It begins with earthy, garrigue infused aromas that open with air to reveal sweaty, red strawberry fruit. In the mouth the flavors quickly fill with ample flavor and incredible amounts, for its age, of red fruit. This wine is very much alive with brighter red fruit towards the finish and lively acidity throughout. It ends with an ethereal, mineral finish. This bottle drank great over four hours. Clearly this is a wine from a different era. ****(*) Now but will last. Imported by Vineyard Brands. Alcohol 13.5%. Darker than the 1964. The nose sports more stink and barnyard but does reveal a floral and herbal freshness. The flavors are controlled with an acidity driven start and short finish. There is a fair amount of barnyard character here but it is not off putting. Less advanced than the bottle tasted last month but it leaves a similar impression. ** Now. Imported by Vineyard Brands. Alcohol 13.5%. The nose is rugged, smells older and past-prime, eventually of blood. The palate confirms this is not in the best shape for it is compact and short in flavor. The acidity and aftertaste are there but this bottle is old and not a good representative. Not Rated. Imported by Vineyard Brands. Alcohol 13.5%. The lively color is promising and fulfilled by the sweaty aromas of leather and smoke. This is an acidity driven wine with red fruit, structure, and surprising youth. It is well-balanced with gentle earthiness and watering acidity. This old-school wine will never be as generous as the 1964 but it will certainly drink well just as long. **** Now – 2031. Imported by The Rare Wine Co. Alcohol 13.5%. The beautiful and fine nose balances earthy and olive aromas. In the mouth the fruit, earth, and acidity are well balanced. This wine has levity with elegant, ripe fruit and a gentle, ripe sweetness that lingers in the mouth. **** Now – 2021. Imported by Vineyard Brands. Alcohol 13.5%. A very different wine with aromas of flowers and candy. With some rough and hard flavors, plenty of acidity, and a tangy finish it is time to drink up. ***(*) Now. Imported by Vineyard Brands. Alcohol 13.5%. Lactic nose. Not right. Not Rated. Imported by Vineyard Brands. Alcohol 13.5%. There is some VA on the nose which the palate confirms as a slightly underperforming bottle. There is however plenty of ripe, strawberry fruit, and strength. Not Rated. Alcohol 13.5%. There is a great nose which conveys tension and complexity with fresh aromas of garrigue, fruit, saddle leather, and stink. In the mouth, this wine has youthful grip, lovely balance, a firm finish, and an inky aftertaste. There is plenty of flavor in the end. ****(*) Now – 2035. Alcohol 13.5%. There are pure flavors of clean, assertive fruit driven by acidity. It shows the grip and tang of the vintage. This is a strong wine with old-school flavors of Kirsch. A good wine. **** Now – 2036. Alcohol 13.5%. This is so young with clean flavors of strawberry and cherry fruit. It is still in early development as it oscillates between flavors of fruit then garrigue and cedar. Good acidity. ***(*) 2021-2036. Alcohol 13.5%. The nose is subtle with mature, earthy aromas. The softer and gentle entry brings dark, sweeter fruit and garrigue in the finish. A fine wine that could use a longer finish, suggesting it is time to drink up. **** Now. Imported by Vineyard Brands. Alcohol 13.5%. Those nose offers animale aromas with bits of berries and Kirsch poking through. In the mouth the concentrated, powerful flavors of ripe fruit cling to the mouth leaving extract in the aftertaste. The flavors are also accented by animale notes. The power is driven by acidity leaving fine, drying tannins. **** Now – 2030. The dessert wines were led off by the 1973 Domaine des Baumard, Quarts de Chaumes. This is a vintage that Phil Bernstein recently tasted at Baumard, where it is still available, so he imported a small quantity. It is lovely stuff! It is complex from decades of age but it is also very lively. There is even a curious red berry fruit flavor. The combination of residual sugar and acidity will see this wine through for decades to come. The 1988 Chateau Raymond-Lafon, Sauternes is drinking great right now. I love Sauternes and this bottle did not disappoint. The 1989 Huet, Moelleux Le Mont Premiere Trie, Vouvray reminds me of an apple orchard but it was too subtle and short in the finish to warrant much excitement. The nose was stinky at first with cheese and some tuna. This is a tight and vigorous white wine with flavors of apricots, apple spice, and creme brulee. It is a little thick with noticeable residual sugar. It is quite complex and offers surprising red berry fruit in the middle. There is plenty of acidity that will see this wine through many years to come. **** Now – 2036+. Imported by Luke’s Distributing Co. Alcohol 13.5%. The attractive amber color is followed by a robust nose. The tangy fruit is matched by well-balanced residual sugar and acidity. It soon becomes clear there is great sweetness here from ample residual sugar. Drinks well right now. ***(*) Now-2020. The subtle nose is followed by apple and fallen orchard fruit making it the most vinous of the dessert wines. It is perhaps, a little subtle and short to warrant future aging. *** Now. This past weekend Lou and I went to a fun dinner party where we ate heaps of meat and drank some old wine. Lou’s friend Todd spearheaded the food side of things and Lisa offered up her place. This meant that Lou and I selected the wines. 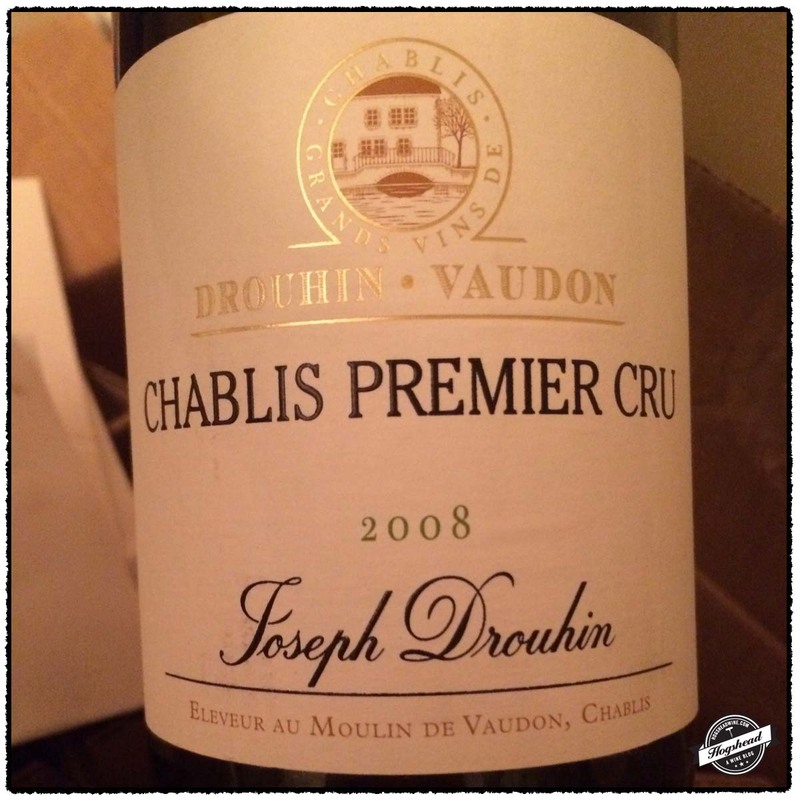 We started with a very fresh tasting 2008 Drouhin-Vaudon, Chablis Premier Cru. It showed younger than I expected with the bottle age taking off any rough corners and adding a hint of orchard fruit. Once everyone arrived and set about tucking into the cheese and charcuterie, we cracked open the NV Michel Turgy, Reserve Selection, Champagne Brut Blanc de Blancs and the NV Vilmart & Cie, Grand Cellier, Champagne Brut Premier Cru. 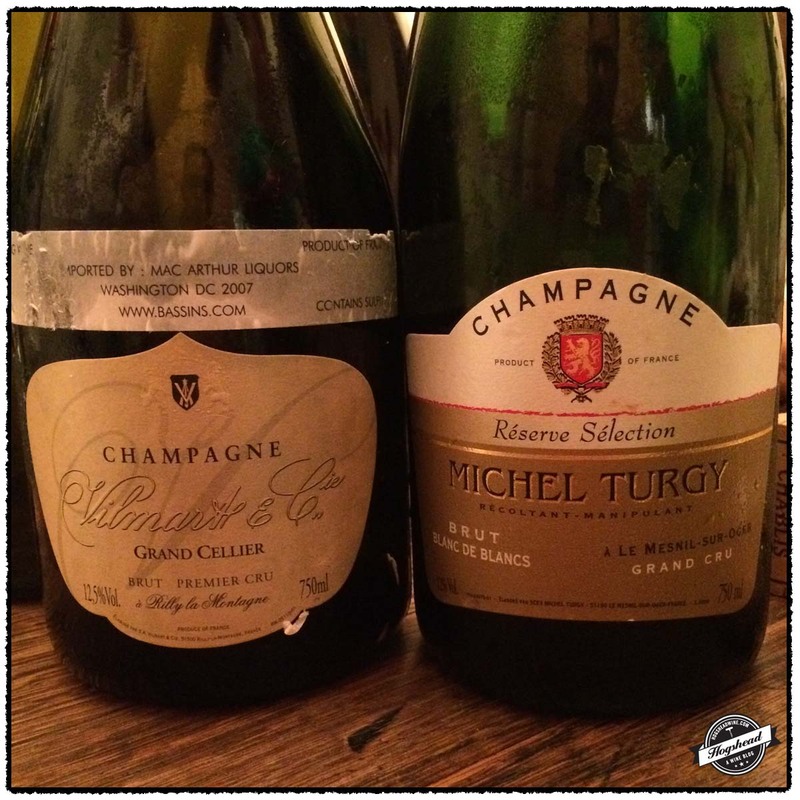 The Turgy is a pure Chardonnay based Champagne that was vinified entirely in stainless steel. The Vilmart is a blend of mostly Chardonnay with Pinot Noir that was both fermented and aged in oak. This made for an enjoyably different pair of wines, with the Turgy very aromatic with mature aromas and more explosive bubbles. The Vilmart had a subdued nose but was top-notch in the mouth with a luxurious mousse and all around harmony. I highly recommend you seek out both of these. With our palete wet we moved on to a trio of Pinot Noir. I have written about the 2001 Domaine Serene, Pinot Noir, Evenstad Reserve, Willamette Valley and 2003 Brick House, Pinot Noir, Cuvée du Tonnelier, Willamette Valley before so I shall pass over those. 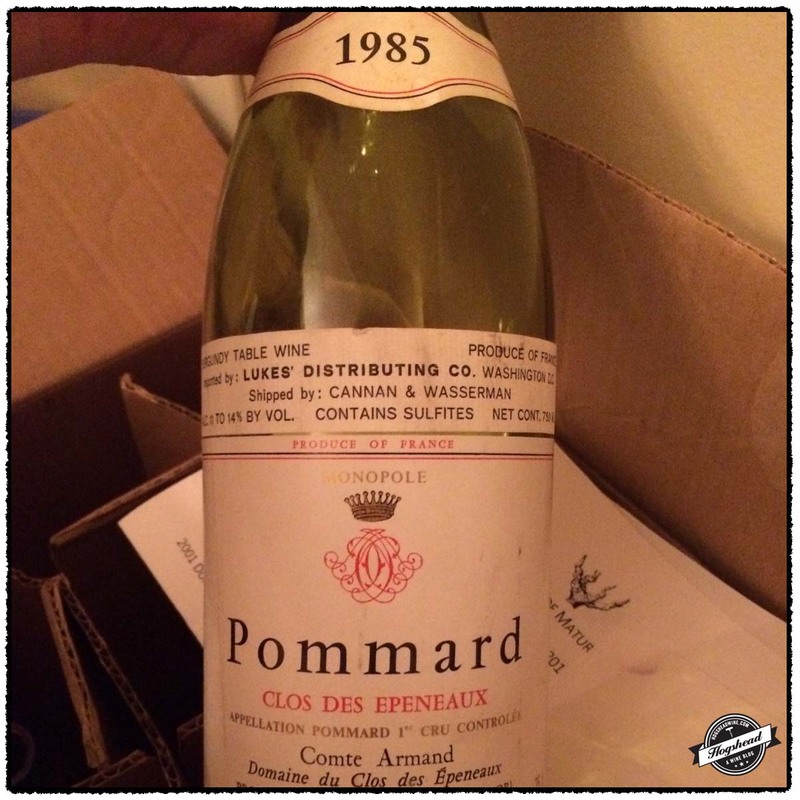 The third bottle, in the form of the 1985 Comte Armand, Pommard Clos de Epenaux, showed an attractive maturity with plenty of earthy aromas that pervaded through the mouth. We have drunk one bottle before that seemed very young, this bottle was very expressive with good strength. With the bottles of Pinot Noir drained we moved on to a pair of Bordeaux. 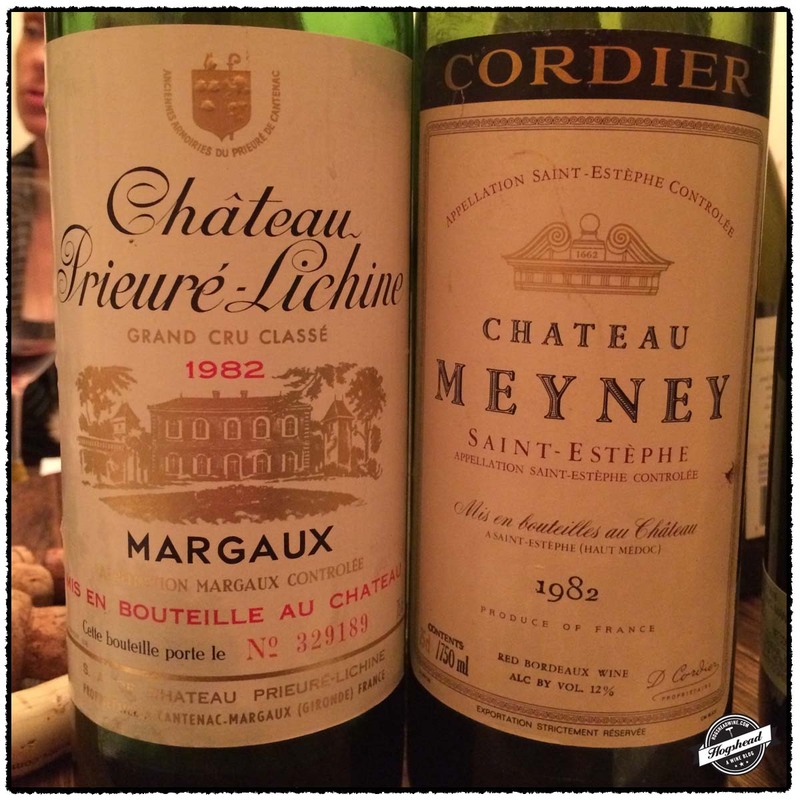 Perhaps the 1982 Château Prieurié Lichine, Margaux was destined to be a mere solid experience due to the heat stress in Margaux or the estate itself. It was, nevertheless, a decent wine that only helped elevate the excellent bottle of 1982 Château Meyney, Saint-Estèphe. The Meyney proved quite aromatic with satisfying presence in the mouth. It was both mature and youthful at the same time making for a fine glass. 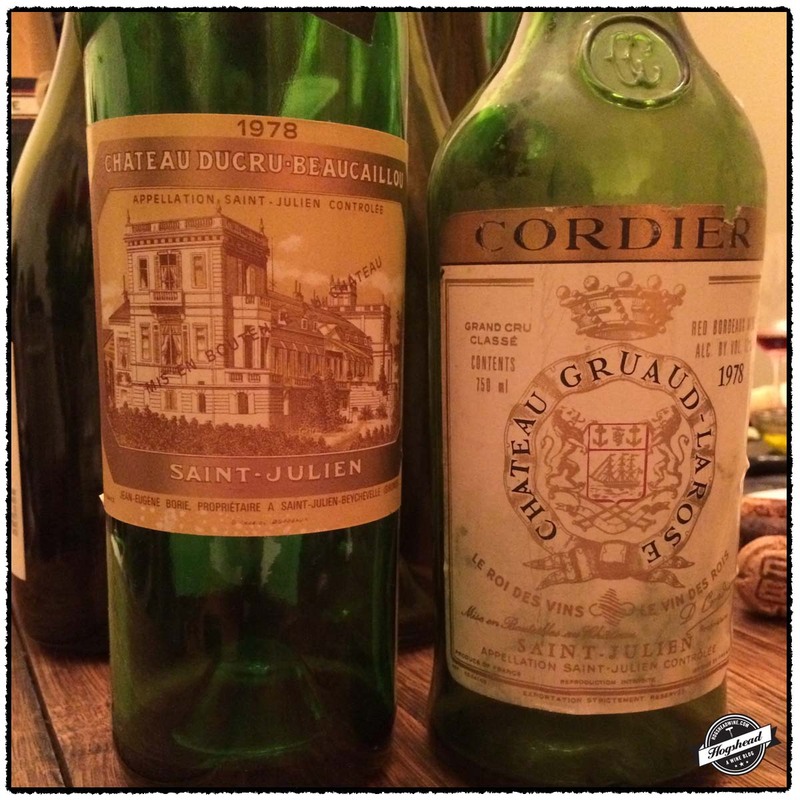 For the 1978 vintage we opened a pair from Saint-Julien. I had high hopes for the 1978 Château Ducru-Beaucaillou, Saint-Julien but this particular bottle offered darker red fruit, that while good, did not have quite the vigor it should have. The 1978 Château Gruaud-Larose, Saint-Julien on the other hand was completely open with its aromatic nose, expansive flavors, and strength. You could generally say the 1982s were fruitier and the 1978s were more rugged. More importantly, though, all four bottles provoked delight and were drained of their very last drops. To transition to the Sauternes course we selected the 1977 Ridge Late Harvest Zinfandel Trentadue Ranch, Sonoma County due to the bit of residual sugar at bottling. From a drought vintage in California, I was prepared for it to be sherried at this age. It wasn’t! In fact it was like a solid, rustic old Californian wine. Be it the high alcohol level or its age, it drank more like the previous wines than a dessert wine. Lou is a firm believer in old Ridge wines and this bottle demonstrates why. I wish I could write more about the wine but I only had a tiny pour as I was quick to check on the Sauternes. Both of our bottles of Sauterne were from good vintages. 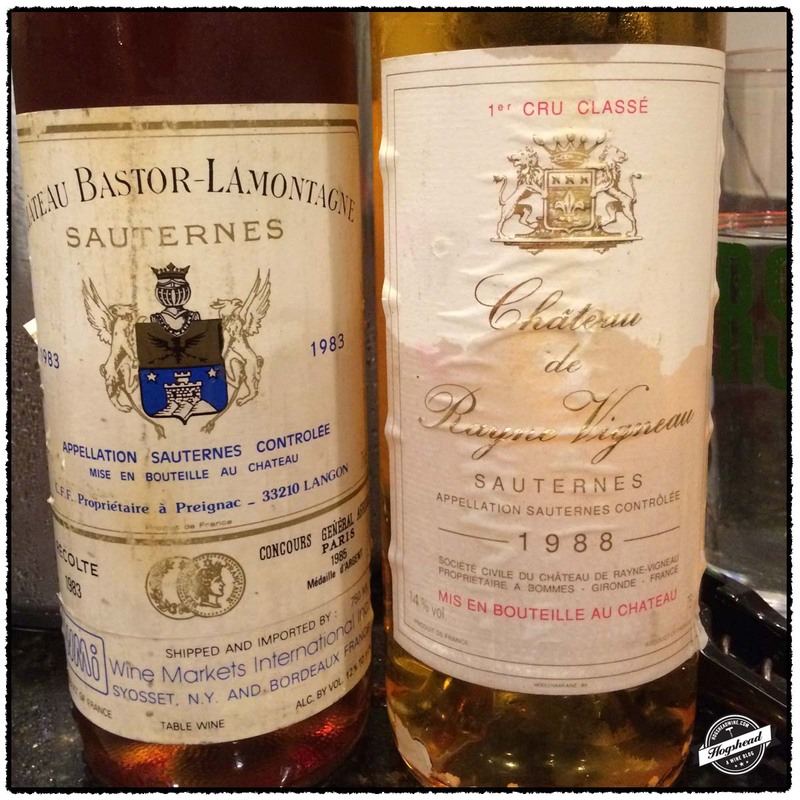 I expected the 1983 Château Bastor-Lamontagne, Sauternes to be more advanced given the color and simpler given the reputation. My expectations were met for there was a burst of mouthfilling, dark, botrytised fruit followed by a simpler and shorter finish. The sweetness was more obvious too. Quickly down the hatch it went! With everyone adjusted we poured the 1988 Château de Rayne Vigneau, Sauternes. This is an important vintage for the vineyard had been replanted, the rebuilding of the chais was complete with new stainless steel tanks, new barriques, and a cold chamber first employed for the 1987 vintage. Fortunately, the cold chamber was not required for the 1988 vintage which was the first to experience the pneumatic press. All of these updates showed through the wine. It was beautiful, more on the elegant side but it sported a finely articulate nose with perfectly balanced fruit, acidity, and sweetness in the mouth. As Lou commented, it is ready for a long future of development. Many thanks to Todd, Lisa, and everyone else for such a fun evening!